Since becoming engaged, I've become even more obsessed with Etsy than I previously was. If that could have been possible. There is anything and everything you could possibly want to buy for your wedding on there. I've been feeling a little down in the dumps lately about having such a long engagement, so I figured that I would get a start on some things that I could start now. Which includes buying some things ahead of time, and doing as many little DIY things ahead of time right now. So, as you can see, I have been busy with my internet purchasing addiction. I'm excited that things are starting to vaguely come together. We have about 500 days until the big day (which still seems like such a long time), so I am just trying to bide my time a little bit more. We did just book our photographer, but I'm just waiting for our contract, and then I will share that with you! She is an amazing photographer, and I'm so excited to work with her! I love everything! On the bright side, you can spread out your purchases with a long engagement so your finances don't take a huge blow all at once! 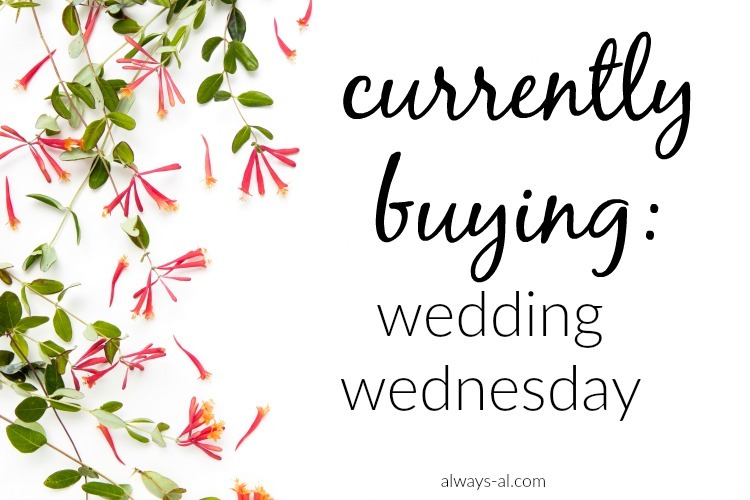 But I'd be impatient, too... ;) Loving your wedding Wednesday posts! I feel you! Etsy is sooooooo tempting when you are engaged. I just want to buy everything! I've been trying to use it mainly for ideas and try to make some of the things I want myself. I'll probably order a few things, though! I love that rubber stamp! My youngest daughter will be engaged soon. She's the baby of the family and the last daughter to be married, so I'm looking at all things wedding right now. Love all of your finds! 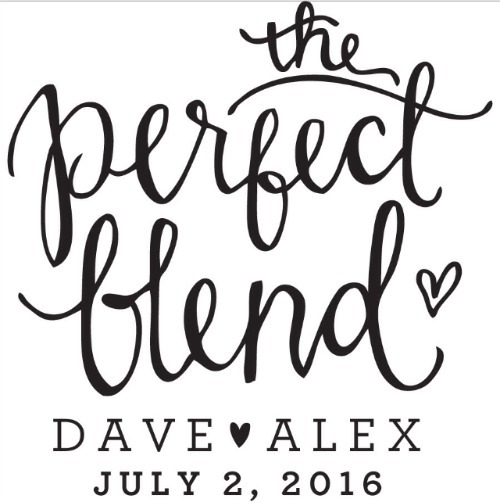 The Perfect Blend....that is SO cute! I totally feel ya with Etsy, I can not stop buying! Adorable ideas!! And great idea getting a head start! You will be so thankful you did that when time flies and it's suddenly 3 months away and you don't have a bunch left to do (or worse, buy!). 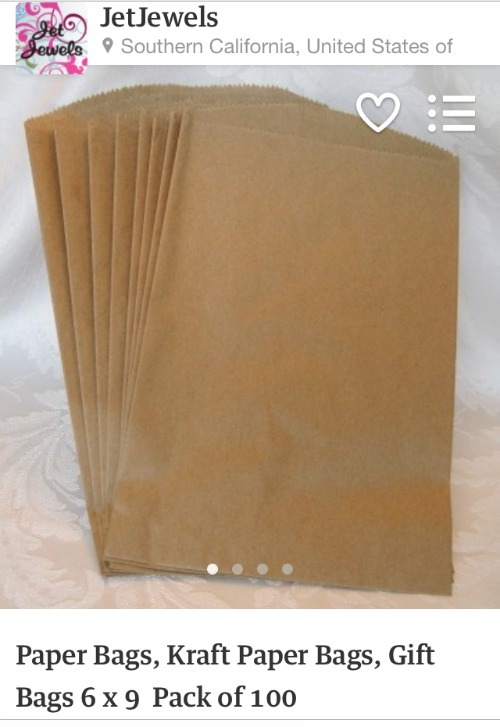 I could get into so much trouble on Etsy, it's not even funny! 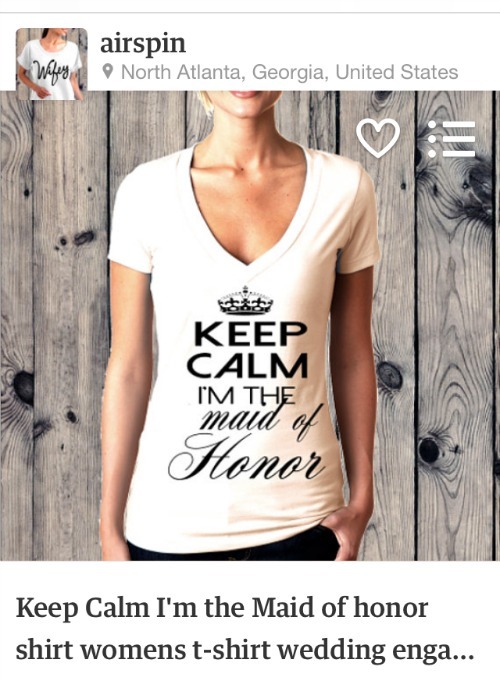 I LOVE that MOH shirt - I wish I could have found one of those for mine!! Thanks for linking up with us this week. these are so cute! Congrats! I am engaged too! I am fairly new to Etsy but I love searching wedding stuff on Pinterest! Thanks lady! That was part of the plan, and now I'm in full shopping mode :) I almost would rather shop for the details than the big things! I've been gathering ideas on there and on my secret Pinterest board for a few months, and just now I feel comfortable buying things. Now I just feel the itch! Congrats on being the MOH! You need that shirt! :) I have a Pinterest board as well, but because that is mostly for ideas, I like to keep that private. You two should definitely start a shared Pinterest board! My mom and I had one (a little bit before I got engaged) and we bounce all our ideas off eachother. That etsy shop where the stamp is from is amazing! Right!! Have you decided what our favors are yet? That's what I was thinking. Both for my sanity and my wallet! I know! I usually have to restrain, but this is a good reason not to! I'm glad I'm not the only one! Sometimes people look at me like I'm nuts! I just want to get started, and I want to save a little bit of money throughout the engagement time. Thanks! Etsy has been awesome for finding great things. I originally was looking for a rhinestone shirt for her, but she will like this better! Aw thank you! Congrats to you as well! Etsy and Pinterest are lifesavers! We have a shared (secret) Pinterest board, too. I need to check out that stamp. haha I want ALL the tees! One for every occasion! It is literally so hard to resist. AHHH! I just got a necklace from Francesca's with my Fiance's inital on it to tide me over. But the necklace that Nadine from East& posted is on my wish list! !